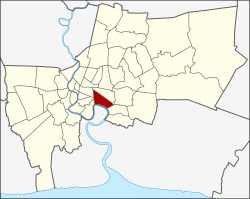 Neighboring districts are (clockwise from the north): Watthana, Phra Khanong, Phra Pradaeng District of Samut Prakan Province (across the Chao Phraya), Yan Nawa, Sathon, and Pathum Wan. The area has a history dating back to the ninth century as a port to cities upstream along the Chao Phraya River, such as Pak Nam Phra Pradaeng (Thai: เมืองปากน้ำพระประแดง) (as opposed to the current Phra Pradaeng District) built during the King Phutthayotfa Chulalok period. Khlong Thanon Trong (Thai: คลองถนนตรง) was a khlong (canal) and a parallel road built by King Mongkut around 1857. Later, different sections of the canal became known as Khlong Toei and Khlong Hua Lamphong. Khlong Toei means 'the canal of pandan', as the plant grew along the southern bank of the canal. The road was renamed Rama IV Road by King Vajiravudh in 1919. In 1947, a large portion of Khlong Toei canal was filled to expand the Rama IV Road surface. The area was once part of the Phra Khanong District, but on 9 November 1989 it was separated to form the new Khlong Toei District. Originally Khlong Toei consisted of six sub-districts, three of which later formed the new Watthana District (announced on 14 October 1997, effective 6 March 1998). Khlong Toei is both the name of a sub-district and the district in which it lies. Phra Khanong is both a sub-district of Khlong Toei and a district on its own, with only sub-district Bang Chak. Furthermore, all three sub-districts listed above have counterparts with the addition of "nuea" (north) in Watthana District. Khlong Toei Port, also known as Bangkok Port, was Thailand's only major port for sea transportation of cargo. Its construction began in 1938 and finished after World War II. The port is on the Chao Phraya River, not far from the Gulf of Thailand. Due to its limited capacity and traffic problems caused by semi-trailer trucks, many of its operations have moved to Laem Chabang Port in Chonburi Province since its opening in July 1981. Tamnak Plai Noen, the historic residence of Prince Naris, now converted into a small museum. The Emporium, a luxury shopping center. Nana Plaza, a major adult entertainment center, known for prostitution and go-go and hostess bars. Queen Sirikit National Convention Center, served by the MRT station of the same name, hosts various exhibitions around the year. The venue will be closed for renovation following contract extension. 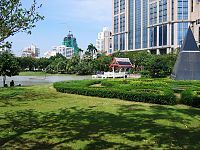 Benjakitti Park, a public park next to the convention center. It includes a lake and is on land that was formerly occupied by the Tobacco Monopoly, the government's tobacco factory. Benjasiri Park, a public park created to commemorate Her Majesty Queen Sirikit's 60th birthday. It is next to the Emporium. Chuvit Garden, a public park in the district created by massage parlor tycoon-turned-politician Chuwit Kamolvisit from his own plot of land, about 2,400 m² in size and worth about 1,250 million baht at the time of opening. Opened in December 2005, it is on Sukhumvit Soi 10. Khlong Toei Market, Bangkok's largest wet market. The Khlong Toei slum, south of the expressway and north of the port, is the largest and oldest slum of Bangkok. It houses some 100,000 people on about one square mile (260 ha) of land owned by the Port Authority. PAT Stadium off Sunthon Kosa Road. Lumpinee Boxing Stadium, an indoor Muay Thai arena, now moved to Ram Intra Road, Bang Khen District. Suan Lum Night Bazaar, closed due to contract expiry, now moved to Suan Lum Night Bazaar Ratchadaphisek. Stock Exchange of Thailand Building. Now the office is moved to Huai Khwang District. BTS skytrain (BTS) stations in the district are Nana, Asok (with interchange to MRT Sukhumvit station), Phrom Phong, Thong Lo, Ekkamai, Phra Khanong, and On Nut, all along Sukhumvit Road on the BTS Sukhumvit Line. MRT (MRTA) has stations Khlong Toei, Queen Sirikit National Convention Center and Sukhumvit (interchange to BTS). Eastern Bus Terminal (also called Ekkamai Bus Terminal) has inter-city buses to destinations such as Pattaya, Rayong and Trat. It is on Sukhumvit Road, near the Ekkamai BTS station. The head office of Asia Atlantic Airlines is on the 11th floor of the Times Square Building in Khlong Toei District. The State Railway of Thailand (SRT) is a huge landowner in Thailand. Its latest property development scheme is the Chao Phraya Gateway project, a mix of hotels, shopping centers, and condominiums. It capitalises on SRT's 277 rai, 1.16 kilometre stretch of land on the river in the Khlong Toei District. The SRT hopes the project will help clear its 100 billion baht debt. The project is projected to break even within eight years and deliver profits of 140 billion baht. As of April 2019[update], SRT's plans are being submitted to the Transport Ministry for approval. The Sacred Heart Convent School is in Khlong Toei. ^ "QSNCC event holders seek new homes". Bangkok Post. 2 April 2018. Retrieved 2019-04-17. ^ "Chuwit opened billion Baht value garden, asking other billionaires to do the Same". Manager (in Thai). 24 December 2005. Retrieved 11 December 2015. ^ Sapsuan, Peewara (2014-04-28). "Bangkok's Klong Toey Slum". BORGEN. Retrieved 2017-11-06. ^ Hongtong, Thodsapol (2019-04-16). "SRT eyes new city river icon". Bangkok Post. Retrieved 2019-04-17.